Bing Vs Google | It-11 Audio / Tonegeek"
← Android market, Google Music : rumors ? 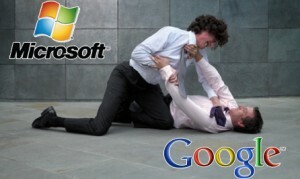 Accusations of Google against Microsoft are a bombshell. Fight between two heavyweights in which one has laid charges against the other copy of the search results to its own search engine. And Bing, take this ! Google declares that Microsoft presents results from Google in their page of results printed by Bing. Bing would integrate its search engine results and keywords that lead to these results. Google has even stretched traps Microsoft to confirm his statements. Pages were created with words that do not exist. And they are found by the Microsoft search engine. According to Google, the Trojan would be Microsoft Internet Explorer allows Bing to retrieve search results. Stefan Weitz, director of the Bing, did not comment on the charges yet. And Steve Balmer, CEO of Microsoft, did not manifest. This entry was posted in What's up, doc ? and tagged accusation, bing, google. Bookmark the permalink.